Through out the Bible, God calls out the rejects, misfits, and outcasts of society to be used for his purposes. Orphaned criminals, Jake and Elwood, are given a mission. His purposes often involve delivering an oppressed group or tribe from a tyrant, from the evils of society, and/or from their own self-destruction; not to mention a specific recognition to the importance of caring for orphaned, widowed, and elderly. The mission is to save an orphanage. An orphanage taking care of orphans, ran mostly by older single females, which will be shut down by the government/bank, unless they are able to pay a significant amount of money. Within these situations, God’s chosen one(s) face impossible circumstances, yet through His divine, and sometimes rather odd, intervention the impossible becomes possible. Tens if not hundreds of police cars, a SWAT team, Illinois Nazis, violent country western musicians, and an illegally armed princess Leia attempt to stop and/or kill the Blues Brothers. Our heroes avoid doom by leaping bridges, driving through malls, flashing eyebrows, disrupting dinner at an expensive restaurant, and spontaneously executing a crowd-pleasing country and western musical set. It’s not uncommon for the chosen one(s) to make terrible mistakes or selfish decisions along the way, but those actions don’t go uncorrected. 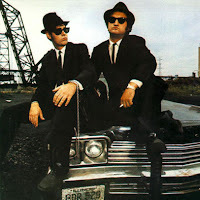 Elwood’s apartment is blown up, they are beaten by a nun, they pay back money they owed, and they return to prison. And despite the overwhelmingly human characteristics and limitations of the reject(s), misfit(s), and outcast(s), God’s purpose is served through them. They collect enough money to save the orphanage and restore hope for a vulnerable people.